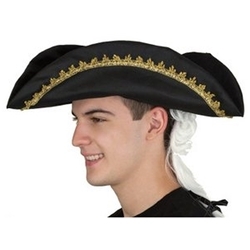 Black tricorn hat decorated with gold trim and featuring an attached white hair styled into a pony tail. Hat is one size fits most, up to a 22.5" head measurement. This hat isn't meant to be realistic, but it does make it easy to create a colonial period look. This hat can be used as part of a colonial costume or worn on patriotic American holidays such as the 4th of July. Wear this hat on its own or with a pair of knickers and a simple white shirt to create a quick and easy colonial era costume.